Jacksonville NASL: Does the Commissioner Want You to Watch Another League if You Don't Agree? The supporter groups of the Fort Lauderdale Strikers and Tampa Bay Rowdies protest NASL Commissioner. Photo Credit, Chris Arnold. Some supporters groups are finally fed up with Bill Peterson and his leadership of the NASL. After a flash point Thursday with the Tampa Bay Rowdies supporters group, they put their frustrations into action. Before I get to the events that led to the actions at Lockhart Stadium during the Florida Derby, let's look at the man who is the commissioner of the North American Soccer League. Bill Peterson is a man who is use to failed ventures. According to the league's bio on Peterson, he has served as COO of the United Football League (A league full of so many problems it actually folded in season), and lasted less than a year as President of the poorly thought out NFL Europe (Despite being long serving GM of the Amsterdam Admirals). Soccer wise, he spent six years as Senior Vice President of AEG Sports and Managing Director of the Home Depot Center. Looking at all the various roles he's had over his years, it reads like a 'I'm not good enough for this, so I'm going to go do that'. He seems a man who can create a vision, but the man who cannot see any vision out. * He did not reverse a poorly thought out decision that allowed the New York Cosmos to be Soccer Bowl eligible despite only playing the fall half of the 2013 season. If the season was to end today, they would play Atlanta in the Soccer Bowl. * In July, he approved expansion into the Oklahoma City market. Rumors have circulated (though it must be stressed unconfirmed) that the group accepted from Oklahoma City was rejected by USL and their tougher admission standards. There has some minor speculation that Peterson receives a hefty bonus for every expansion team the NASL approves. Again that's also unconfirmed. * After an incident on September 15th in Edmonton that saw the majority of the Fort Lauderdale Strikers' coaching staff ejected, it took three days for Peterson to say anything publicly on the situation. During that time, Peterson did not speak on the subject despite numerous media inquiries on the matter until issuing the suspension. * On September 20th, it was reported on the Ultras Alive Podcast, following a Fort Lauderdale Strikers fan forum that Bill Peterson admitted to a journalist that he had never read the NASL Rules and Procedures. It's a pretty damning admission that the head of the league has never read up on the procedures of the league he runs. While fans have felt they could at least engage Peterson, it could be said that all changed after Tampa Bay's trip to New York. The fixture had been rearranged, and some fans were unable to get in on Tampa Bay's group rate to make the trip north. While those who had committed early to the group rate were okay, many others had to pay the balance out of pocket. During the game there was a fan incident that took place at the end of the game in New York between the Rowdies and Cosmos. Depending on who you ask will determine who and what started the incident. on Monday, Charlie Cole, the leader of Ralph's Mob (the Tampa Bay supporters group), attempted to reach out to Bill Peterson in order see if any actions would be forthcoming in wake of that incident. 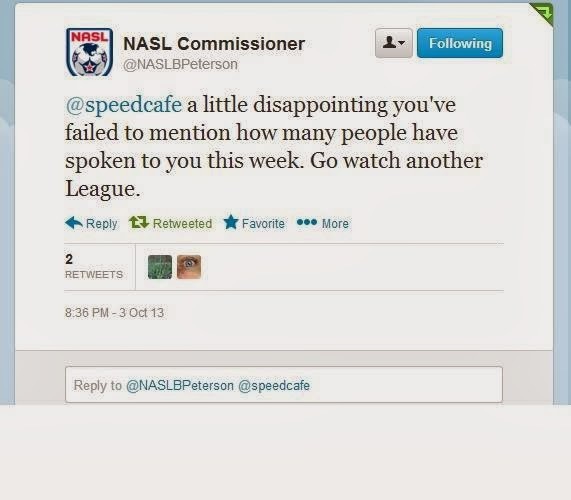 Those calls went unanswered, and on Thursday sent a tweet to Bill Peterson, who then not only sent the reply to the wrong account (the account in question should have been @speedcake), sent the following as his official league response. The first bit has been proven to be an outright lie, the second bit is simply inexcusable for any leadership of a flailing organization. The tweet that has since been deleted caused an immediate uproar among the supporters groups in Tampa Bay and Fort Lauderdale. They all knew something had to be done, but what to do still remained in question. Some brought up the idea of a banner, which seemed to be immediately accepted as an idea. But others wanted to go one further and stage a mass walkout on the game. That brought about some mixed reactions among the three supporters groups. Almost immediately after realizing how stupid the above mentioned tweet was, Peterson had already tried to go into damage control mode among the varying supporters groups. Those who were against the walkout did not believe what Cole was saying to be an accurate version of events that led to the above mentioned tweet. However, it didn't take long to convince them with actual visual evidence that Peterson's version of events were a lie. Once Cole was able to convince them Peterson was selling them a bill of goods, it didn't take long for all three supporter groups in attendance to agree to a mass walkout. The fact that all three groups agreed to do anything in unison is a feat in and of itself. While most of the banter between the Fort Lauderdale and Tampa Bay is generally in good fun, they have had plenty of heated moments in recent times. 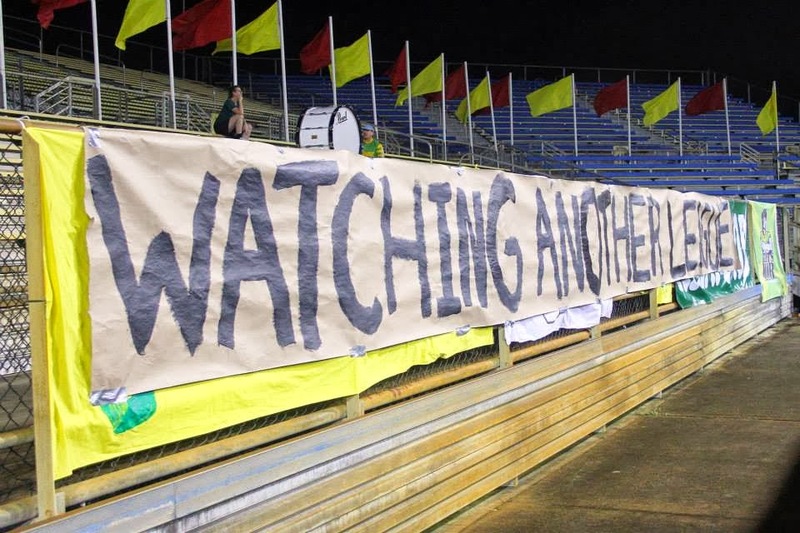 Despite attempts from Andrew Nestor (CEO & GM of the Tampa Bay Rowdies) and Rishi Sehgal (Director of Business Development and Legal Affairs for the NASL) to stop the walkout from happening, 15 minutes into the Florida Derby, all three supporters groups emptied out. Once they got out of the field of play, some chanted expletives about Bill Peterson to let him know they were not happy with what he said. After 15 minutes, some returned to watch the remainder of the game while others simply left. While I think a sustained chant of "Peterson Out" would have been a much better course of action than using expletives, I can empathize with those fans. With Jacksonville getting a team in 2015, I have to seriously question if Peterson is the right man running the NASL. If his reaction to very passionate fans that spend their hard earned money is to tell them not to watch, then he doesn't need to be the position of power he is. There needs to be a flat out apology written for the NASL website, he needs to go on every public forum and media that will still have him and offer a heartfelt regret. Anything that smells of bull will be quickly pounced on...just like his lies were Thursday night. Before I begin, I want to apologize for the lack of posting over the last week. I've been a little bit under the weather. I cannot promise normal service next week either as life has gotten in the way of what I love to do. I will try and get something up this weekend, but I can't promise it. If you want my thoughts on the games I can follow as they happen, check out my Twitter feed throughout the weekend. With that said, onto my thoughts and predictions on this weekend's fixtures. Kickoff times are EDT. PLET stands for Premier League Extra Time. All games available on NBC Live Extra. Check your provider for availability. These are my thoughts/predictions on this weekend. What are yours? Let me know in the comments below. Here are my thoughts on a telling Sunday of Premier League action. You could half forgive Moyes for the setup against Chelsea since Chelsea set up to finish the game 0-0. You can't forgive how lethargic Manchester United played against Liverpool. After watching the Manchester Derby, the set ups now show a pattern that should make any Manchester United fan seriously question their manager. With Robin Van Persie injured, one would assume that starting Shinji Kagawa would almost be automatic. Instead, Kagawa was an unused substitute in the 18. In the three big games Manchester United have had in the league this season, Kagawa has not seen a second of action. Sir Alex Ferguson saw his worth of both busting up play and his ability to link the midfield to either Rooney or Robin Van Persie. The value that brings to a side was sorely missing today. Instead David Moyes played two players who looked completely out of his depth. While Fellaini may have had his better games for Everton against Manchester City, he looked like a clueless midfielder who couldn't connect a pass or track back fast enough on City counter attacks. Both Ferguson's and Moyes's fascination with playing Ashley Young has become absurd bordering on insanity. I hate to put this bluntly, but Ashley Young is not a player that is of the caliber a top team should have. Young isolated himself too often, gave away the ball more often than he distributed it and generally looked disinterested on the pitch. It has to be asked of everyone with the exception of Wayne Rooney; does anyone at Manchester United care anymore? Wayne Rooney was the only player on the pitch that looked like he wanted to win. Even with RVP on the pitch I don't think Manchester United had enough to get goals. I'm convinced the only reason United even got their lone consolation goal was because Manchester City too so long to sub Aguero out late, Wayne Rooney had time to decide what he was going to do with that free kick. One final scary thought for Manchester United is looking at the bench, there is no impact player that can come off and not be treated as a like for like sub. David Moyes failed to address that this summer, and it has shown in their three major games at the start of this season. Had they played Kagawa in any of those matches, there's a good chance they get more than 1 point from the 9 on offer. The start of the season did Manchester United no favors. However, David Moyes's approach to treat the start of the season like he did every season at Everton is winning him no additional fans. It's okay to start slowly at a club with limited resources and finish around the Europa League places. It's not okay to start slowly at Manchester United, when trophies are the expectation and not the norm. Since the Premier League has gone to 38 games, no side has won the title after getting 7 points from the first 5 fixtures. While it isn't a league fixture, the League Cup tie against Liverpool on Wednesday just became a must win for Manchester United. * Today could be a defining day for Tottenham Hotspur. In years past, Spurs would have either drawn 0-0, or lose 1-0. The late substitution to bring on Lewis Holtby was a major factor in Tottenham getting a late goal. He helped shut Cardiff down late in the midfield and keep the play in Tottenham's attacking half. The only concern I have for Tottenham right now is that they need too many chances before they score. Spurs can get away with that when they play sides like Cardiff City, but they didn't when they played Arsenal. They might not get away with it either if Jose Mourinho is motivated next weekend. * Three names stand out to me for Manchester City today. Vincent Kompany's return was simply impressive. He shut down Manchester United through the middle. Samir Nasri had one of his better performances in a Manchester City shirt. Finally, when United was starting to make some minor waves forward, James Milner's substitution immediately shut that down. It should also be said that once Manchester City got a grip of this game, they didn't let it go. * I feel for David Marshall. For 92 minutes, he was simply flawless. Marshall's one mistake was over committing to the byline cross late, which allowed Paulinho to back heel the ball into an empty net. * Ozil continues to prove his worth for Arsenal, creating all three Arsenal goals from set pieces today. While that's good for the time being, someone else needs to help him out in the distribution for goals department. Arsenal's reaction on a whole after giving up the equalizer was also worth noting. It is already improved over opening day. Furthermore, it was greatly improved over years past. It was almost a full circle moment to see Ramsey score against Stoke City as well. * Swansea City didn't have to do much to get two early half goals to see Crystal Palace off. I know it's early in the season, but is Crystal Palace already counting the minutes before they're back in the Championship? After a curious Saturday of Premier League action, here are my thoughts. After a first half that saw Everton look clueless against a West Ham side that pressured whenever Everton had possession of the ball, one sub and three players made sure Everton left Upton Park with all three points. The halftime substitution of Lukaku and McCarthy immediately changed the tune of the match. Lukaku was able to hold the ball up, get West Ham players to commit, and distribute effectively. It also helped to that Ross Barkley was finally able to get space to earn not one, but two very attacking free kicks. Both times, Leighton Baines made West Ham pay with pinpoint accurate free kicks that Jussi Jaaskelainen was a mere spectator to. Where this match really turned though was the moment Mark Noble was sent off. After being beaten by Barkley in midfield, Noble decided to do all the work himself. Instead of trusting his defense to take care of his mistake, Noble reached in and took Barkley out from behind. Having been booked 14 minutes earlier it was a challenge that was unnecessary. There was cover behind Noble, and he should have known it. Instead of being the man responsible for possibly giving West Ham all three points, he became the root cause of giving Everton all three. The game winner came from Lukaku's awareness to exploit the hole in the midfield defensive line where Mark Noble was playing. Mirallas did an exceptional job to keep the ball in play and get the cross in. What Lukaku did here was amazing, because not many forwards today would have gone for the ball with the commitment Lukaku did here. Getting clipped after making contact, Lukaku didn't even realize he had scored the game winner (and admitted it to in his post match interview). What was even smarter by the man on loan from Chelsea is the fact he knew where the space would be to exploit. West Ham screwed themselves in this one. They had plenty of opportunities in the first half to make Everton pay for their wastefulness and didn't take advantage of them. Everton kept their ace in the hole until needed, and Lukaku proved his worth. Roberto Martinez may have had to win ugly, but he's slowly starting to show he knows what to do with this squad. I bet he's also thankful to have kept a hold of Leighton Baines. Twice, Hull City came back twice from Loic Remy goals, before Sone Aluko's perfect side volley gave Hull City a remarkable 3-2 victory at St. James Park. Loic Remy didn't have that special of a game, but Remy showed why he was a wanted man on loan. His positional sense put Newcastle United up on two separate occasions. The first came from a mishit by Cisse, and the second came off a blocked Cabaye effort that went right to Remy's feet. Both times McGregor was out of position for what became rather routine goals. Though he scored twice, Remy will be more remembered today for his miss late that would have given Newcastle United an unlikely point. What I will say about Hull City's performance today was that when the chips were down, they found a way to not only outwork Newcastle and create easy opportunities, but get unmarked opportunities. Brady had plenty of space for Hull City's first equalizer, and easily slid the ball between Krul's legs. Elmohamady's second equalizer came off a perfect free kick run that saw him with two yards of space between any Newcastle defender. As the second half wore on, Huddlestone and Livermore ran the show in midfield, and Alan Pardew had no response off the bench to change that. The game winner is my candidate for goal of the month. George Boyd made easy work of a soft Newcastle back line and soon found his way to the end line. With all the space in the world, Boyd spotted another unmarked Tiger insider the penalty area, Sone Aluko. With a perfect pass, Boyd teed up Aluko on a side volley. Tim Krul doesn't have time to react as the ball goes past him off the inside of the post and in. It was a special goal to cap off a win that Hull City deserved. Steve Bruce is right when he says that they finally converted their chances, but Hull City need to be more consistent in doing so. Newcastle should be ashamed of their shambolic defending. However, this day belongs to the Aluko household. Not only did Sone score for Hull City, his sister Eniola also scored for the England women in World Cup qualifying. It was dull, boring, and at time downright ugly to watch at times, but Chelsea finally outlasted a fatigued Fulham in the second half to win 2-0. Fulham had Chelsea's number in the first half, cutting off Chelsea's attacks at every opportunity. In fact, had Darren Bent not gone right at Petr Cech in the 12th minute, Fulham could have easily been 0-1 to the good. Unfortunately for Fulham, that was a good as it got. Chelsea started to erode Fulham's fitness. While it didn't show on the opener (blame Stockdale for that cluster in front of goal), it did show after the hour. Fulham couldn't keep a hold of the ball, and Chelsea were able to pass through them at will. While it took a set piece to put Chelsea in front 2-0, Fulham simply couldn't keep up with Chelsea's movement. Jose Mourinho can say all he wants that he is trying to change the philosophy of the team, but I hear those comments and think they are nonsense. I read those comments as code for 'I don't have a clue what my best eleven are on the park, and until I can do so as well as say I told you so after the fact, I'm going to use that line'. Goal aside, Oscar was missing and influential for large periods of the game. The one player who I did think was effective for Chelsea today was Mikel. Not only did he get off the goal snide, his placement on the pitch shut down Fulham attacks that looked like they might go places. At least Chelsea didn't go walkabout on that Fulham corner in first half stoppage time. * Liverpool were simply too predictable against Southampton today. Steven Gerrard was rather muted and Daniel Surridge just didn't get enough good service to make a difference. Also of concern for Liverpool is the fact they have yet to score a second half Premier League goal this season. It might be a good thing Suarez is coming back this week from suspension. At least with him on the park, he should add an extra layer to Liverpool's attack. * I tried talking myself into believing Dejan Lovren goal should have been waved off. However, as I looked at the replay, it was actually Daniel Agger who first went the wrong way round Lovren, and then grabbing the goal scorer. It was well done by Lovren to shake off the defending to get enough power on that ball to cross the goal line. * What Paolo Di Canio did after Sunderland was embarrassed by West Brom could almost be considered normal behavior for him. It was still pathetic bordering on insane. Di Canio better keep his chin up considering his next two opponents are Liverpool and Manchester United. Is it the perfect schedule for an early season sacking? These were my thoughts on today's action. What are yours? Let me know in the comments below. Kickoff times are EDT. PLET stands for Premier League Extra Time. All games available live on NBC Live Extra. Check your provider for availability. These are my thoughts on the weekend to come. What are yours? Let me know in the comments below. The Premier League returned on Saturday and left us with plenty to talk about in its wake. When I previewed this game, I completely forgot about the fact that over the years, Everton have been the one side that has somehow on a semi-regular basis gotten results against Chelsea. I guess many people, myself included, thought it had passed after the results Rafa Benitez got last season. However, Everton were patient, just organized enough, and caught Chelsea out on the counter to take a deserved victory against Chelsea in Saturday's tea-time kickoff. There were two under rated players for Everton today. Gareth Barry's play in midfield acted like a glue that helped bind the midfield and back four. Besides getting back to block an Eto'o effort on what appeared to be an open goal after a Tim Howard mistake, he was all over the midfield disrupting Chelsea's play in the middle third of the pitch. The other player was Raul Mirallas. When Jelavic was substituted off before Chelsea went completely off the boil, moving Mirallas up top was the perfect foil to take the bite out of the Chelsea attack. His holding play allowed Everton back into their attacking half, resulting in Chelsea giving up plenty of late free kicks to milk time off the clock. While Everton's goal may have technically been the run of play, they deserved a reward for being just organized enough in the first half. With Ramires left on an island due to too many Chelsea midfielders pushing forward, he was easily dispossessed. The cross to Jelavic was perfectly headed back across goal where Petr Cech failed to make an attempt to clear the ball. Steven Naismith had the easiest of headers to put Chelsea in front. This is the second time this season Chelsea have been caught out right before the interval, and I'm sure it will be something other teams quickly pick up on. Chelsea is an absolute mess right now, and Jose Mourinho is doing nothing to make their compounding midfield problems any better. Eto'o had a much better performance than this result shows. His runs put him in advantageous positions but when the midfield gave him no service, it renders him useless. Furthermore, Jose's insistence of playing a back four with two players, Luiz and Ivanovic, out of position is also doing Chelsea a disservice. As much as Jose Mourinho may not want to admit this, Rafa Benitez found David Luiz's natural position as a defensive midfielder. It is embarrassing beyond belief that Chelsea are not playing Cesar Azpilicueta at right back, as Ivanovic and Terry is a much better center back partnership. While Chelsea's fans can act delusional about how poorly their side has played in the opening month of the season, and not question Jose Mourinho, the manager needs to answer questions about why he cannot find his best eleven, and play them. He was embarrassingly caught out by Everton playing Chelsea's old game, and Jose Mourinho didn't have an answer for it. In a first half that was looking like the highlights would be early qualifying for the 2016 Olympic diving (Thought Evra should have been booked alongside Ashley Young), it was one moment of madness right before halftime that shaped Manchester United's 2-0 victory over Crystal Palace. With two minutes to go before halftime, and Manchester United finally starting to work the ball into scoring positions, Ashley Young took a pass near the top of the 18. Young then collided with Kagisho Dikgacoi. Two separate challenges, within two seconds of each other, changed the course of the game. However, many are combining the challenges into one. The first challenge occurred outside the 18 yard box. While it was a strong challenge, it was fair. The second challenged happened just inside the penalty area when Dikgacoi foolishly tackled Young. While Young had just nudged forward, it also appeared that Young was starting to fall to the ground. It was that second challenge that referee saw, and awarded the penalty on. From there, the referee had to adjudge the challenge denied a goal scoring opportunity. After that, the red card being shown was automatic. While Manchester United looked shaky for large stretches of this game, they got the goals that mattered. It helped United that Crystal Palace only advanced forward once in the first half. It was also a chance that Gayle should have finished. While Ian Holloway may not have liked the red card, I believe it was the right decision to be made. When any team spends 42.5 million pounds on one player, that player better come out of the gate on fire. Mesut Ozil did just today in Arsenal's 3-1 win at the Stadium of Light. He picked up where he left off at Real Madrid. His service early to Giroud produced an early opener, and his service later to Walcott should have produced a second. It wasn't Ozil's fault that Walcott had a disappointing outing today. His short passes also allowed Arsenal to keep possession for extended periods of the opening half. However, his biggest attribute today was what Ozil did for the rest of Arsenal's attacking midfielders. With Ozil on the pitch, Sunderland did not know which player to really mark. This allowed Ozil to create passes, and have others in plenty of space to create. This paid off twice for Aaron Ramsey today. I'm not convinced with Ozil on the pitch that Ramsey gets those opportunities. The space Ramsey had on the second goal was simply inexcusable for that time of the match. If today's performance was indicative of what Ozil will do for Arsenal, then it was obviously the right buy. If they can keep him, and get the other injured players back soon, they will make their opening day performance look like an exaggeration in rather short order. It could be argued that Arsenal already has. The other big talking point from the Stadium of Light this afternoon came in the second half, when Martin Atkinson pulled back what appeared to be an obvious equalizer for Jozy Altidore. It is a decision that no one can logically explain why it was called back, and neither can I. After a poor first half, Sunderland finally came out to play in the second half. Craig Gardner pulled one back from the spot not long after halftime, and had numerous opportunities to take the lead. However, after Ramsey pulled Arsenal back ahead, what looked a 50-50 struggle for a ball between Altidore and Sagna outside the penalty area was blown back for a free kick well before any opportunity for an advantage could be played. However, there is one minor flaw to this passage of play, Atkinson didn't whistle for the free kick until after Altidore had got past Sagna and had put the ball past Szczesny. It wasn't until after the ball had crossed into the net did anyone realize that the referee had called the play back for a free kick, and a yellow card on Sagna. Had the referee taken the advice of the assistant referee, not only would the goal have counted, but Sagna still would have been booked for obstruction. With Sunderland incensed, the free kick was never a threat. Had the goal counted, I'm not entirely convinced the game would have ended in a two all draw, but the nature of the match does change. Atkinson should be secretly thanking Ramsey he made it Sunderland 1 Arsenal 3 to at least semi-bail him out of the worst call of the weekend. It still doesn't excuse the call being completely blown. After steadily declining performance for Aston Villa since their opening day victory at the Emirates, I think it's safe to say the opening day performance for Aston Villa was more an exception than the rule. The same could be said in reverse for Newcastle United after their opening day performance against Manchester City. There is a significant difference to each side since those first performances. Newcastle United has found a way to maximize the full services of Hatem Ben Arfa. He was in the right place for the opener to finish a pass that was deflected past Cisse, and his set up shot late allowed Yoan Gouffran to clean up the Guzan save. It has looked since the West Ham draw that Ben Arfa has decided to put this Newcastle United side on his back, and his performances have shown it. If he can stay healthy for the whole season, Newcastle's safety won't be in doubt. Teams have caught onto the fact if they can narrow Aston Villa's play, they can limit what they do on the attack. Villa's lone goal this afternoon came from a set piece, and it was one that would have probably been saved had Tim Krul not abandoned the goal mouth. During open play, Benteke was isolated, and as Villa got narrower and narrower, so did Aston Villa's ability to get forward. When it's all said and done, Villa have to figure out how to create the width they did during the opening two games. If they can't do that, it might be a much longer season for Aston Villa than expected. Those are my thoughts on what I witnessed today. What are yours? Let me know in the comments below. Premier League Predictions Round 4: Will There be Post International Blues? These are my thoughts on this weekend's action. What are yours? Leave them in the comments below. Columbus Ohio continues to be the ultimate home field advantage for the United States as second half goals from Eddie Johnson and Landon Donovan provided the United States a 2-0 victory over Mexico. The result leaves the United States with one firm foot over the qualification thresh hold, with the other over it but not firmly on the ground yet. To say the first half was a sloppy affair would be an understatement. The United States took half an hour to settle down, but Mexico had no bite to their attack. While it appeared early on Mexico may have had a plan 1a, it was a plan not too dissimilar to one fans have seen all throughout this final round of qualification. The most threatening chance Mexico had in the opening stanza actually came from a failed own goal chance from DeMarcus Beasley. From there, early Gimenez and Dos Santos efforts were saved with relative ease by Tim Howard. After that, Mexico's predictable attack seen throughout most of this final round of qualification returned, rendering anything they did moving forward useless. While the United States still looked out of shape in the midfield, they slowly started to inch their way into the attack. Two first half counters, the first from Dempsey and the other from Donovan, were tamely blocked. However, as the first half came to a close, it was looking more and more like advantage USA then it was advantage Mexico. The advantage completely swung in the United States favor just four minutes into the second half. Eddie Johnson worked perfectly off the Clarence Goodson screen before having the easiest look on goal. Corona abandoned his post for reasons no one will ever be able to grasp, and Eddie Johnson had an unmarked header right down the middle of the goal. The men on the posts could only look on as it went into the back of the net for a deserved American opener. After the goal, in a move that I only consider waving the white flag of surrender, Mexico subbed off their player of the match. With Herrera replacing Gimenez in the 54th, Mexico's play got even more predictable. The US defense, looking as settled as it has been in this World Cup cycle, started picking off passes with ease. With the inclusion of Peralta for Arce 20 minutes from time, Mexico's attack became too rushed. With Mexico's desperation getting worse by the minute, the United States picked their spot to secure victory. After a rushed throw in deep in the USA's attacking half, the United States struck. Diskerud made great use of his time on the pitch with a beautiful pick up and turn for the byline. Diskerud's centering pass got just enough of a deflection from Dempsey to get past Corona and through to Donovan. For the second time tonight, the United States had an empty net to shoot in, and Donovan didn't miss. When it's all said and done, the final scoreline was about as accurate a reflection of play as possible. Mexico had no creativity in their final third, and all efforts on frame were easily handled by Tim Howard. Once the United States settled half an hour in, it was only a matter of time before they scored, and Corona gave Eddie Johnson the biggest target in the world to hit. Once Mexico took off their only player who tried to get creative on the ball, the game was over. The United States responded from a poor effort in Costa Rica with the most professional performance one could ask for. Mexico is seriously in trouble. As of this writing, Mexico is 5 points off automatic qualification with two rounds to play. At this rate, Mexico/Panama is shaping up to be a winner take all to play New Zealand. While it would appear Mexico would be favorites over two legs against New Zealand, everyone thought just four years ago New Zealand didn't have a prayer to advance to South Africa. They proved many people wrong in that process. With the transfer window closing this evening, there is certainly plenty to digest. * Arsenal are probably the biggest winner today with the signing of Mesut Ozil. He ticks all the boxes that Arsenal needed in midfield. Not only is he a creator, he isn't afraid to actually shoot the ball from distance. He has a national team partner with Podolski in midfield that he will work very well off of once he returns from injury. Furthermore, it strengthens an already good midfield. While Arsenal didn't pick up a second forward, Ozil can play up top in an emergency if Arsene Wenger is in a bind. * The big surprise winners out of today were Everton. While it didn't look until real late in the day they were going to do any business, they were able to pick up two reliable players in Gareth Barry and Romelu Lukaku. They should make immediate impacts on the pitch this season. Roberto Martinez was also able to pick up a forward that is beginning to show signs of his potential in James McCarthy. While Everton overspent for McCarthy, they were able to milk Manchester United into overpaying for Marouane Fellaini. * Other than Newcastle United not picking anyone up, I can't think of another team who had a worse day than Manchester United. After imposters got in the way of the Ander Herrera deal being made, they grossly overspent for Fellaini. Even more so, they could have had Fellaini just last week for less if they triggered his release clause. Their persistence to pick up Baines in a package deal with Fellaini backfired in the worst possible way. To add to Manchester United's miserable day, their deal to pick up Coentrao failed because of how late they left it. While the paperwork made it to the leagues involved, it did not make it through the system FIFA uses to confirm deals in time. Good luck appealing that after Real Madrid gets second thoughts. * I seriously want to know what Jose Mourinho is smoking, and the legality of such substance. After deciding that Arsenal were a rival and Liverpool weren't (see Victor Moses's loan deal), Chelsea then decide to allow the best forward for Jose Mourinho's system to move out on another loan. Through the first three matches, Lukaku was showing why I thought he could already be a difference maker for Chelsea this season. All Chelsea did today was make other clubs better at their own expense. They are lucky Mata didn't go to PSG. * The most under rated signing today came from Cardiff City in their signing of Peter Odemwingie. While he can be a petulant little bugger at times, he can score goals. Between picking up Kevin Theophile-Catherine yesterday and Peter Odemwingie today, Cardiff City have given themselves a much better chance at a second season in the Premier League. * West Bromwich Albion may have done just enough picking up Victor Anichebe, Morgan Amalfitano and Stephane Sessegnon to survive this season. While I'm unimpressed by Sessegnon, I think Anichebe and Amalfitano will be assets that keep them up this year. * Manchester City could have easily had the worst 2 days of the window. Demichelis has never been an average player, and allowing Gareth Barry to leave only makes them weaker. * While Crystal Palace made many moves today; I am unimpressed by any of them. What were your thoughts on the transfers made today? Let us know in the comments below.